Archie Comics is a comic book company in the United States. Its most famous and popular title is "Archie". This comic book is about a teenage boy named Archie Andrews and his friends: Betty Cooper, Veronica Lodge, Reggie Mantle, and Jughead Jones. Every single character in this comic book is fictional and are created by Bob Montana. All characters were based on people he knew in Haverhill, Massachusetts. Other popular titles include "Sabrina the Teenage Witch", "Sonic the Hedgehog", and Josie and the Pussycats. 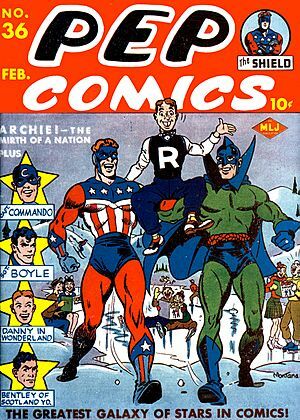 Archie's first appearance was in Pep Comics #22 on December 22, 1941. This addition was drawn by Montana and written by Vic Bloom. Archie lives in a small town named the "Riverdale". The state, or the general location of this town is not known. However, in the early years of the Archie comics, Riverdale was in Massachusetts, and Mr. Lodge was a senator for that state, but this is no longer part of the story. There is also a part of the Bronx in New York City called Riverdale. Archibald "Archie" Andrews, main character, a typical teenage boy with a great interest in dating and sometimes he tends to be very clumsy. Elizabeth "Betty" Cooper, the girl-next-door, very sweet. Veronica "Ronnie/Ron" Lodge, the rich, sometimes nice and sometimes snobbish girl. Forsythe Pendleton "Jughead" Jones III, - Archie's best friend. Jughead is sarcastic, obsessed with food, lazy, and apathetic towards girls. Reginald "Reggie" Mantle, the conceited practical joker. He occasionally dates Veronica and sometimes, although very rarely, goes on dates with Betty. He is also obsessed with another girl, Midge, which usually gets him in trouble with Big Moose, who beats up Reggie. Of all the parents, Veronica's father and Archie's parents appear most often. Mr. Hiram Lodge, Veronica's rich father often hates meeting Archie because Archie is clumsy and causes him trouble. Mr. Frederick "Fred" Andrews, Archie's father is pear-shaped, old-fashioned, and balding. Mrs. Mary Andrews, Archie's typical all-American suburban mother. Mr. Waldo Weatherbee, the school principal, popularly referred to as 'The Bee'. He is often a victim of Archie's clumsiness, and he often punishes Archie by keeping him after school. Miss Geraldine Grundy, a teacher at Riverdale High is usually shown as an English teacher. She also teaches every subject except gym or chemistry. Most students consider her a "nice" or "good" teacher. She is pretty old with white hair. Miss Bernice Beazley, the grouchy school cafeteria cook. No one likes her food except Jughead. No one likes her but herself. Archie Comics Facts for Kids. Kiddle Encyclopedia.